Complexity may be an adaptive response. Adverse conditions often increase the stamina and adaptive ability of survivors. All living creatures have a complex large molecule at their core called DNA for short by biologists. DNA or deoxyribonucleic acid depicted here in the picture at left by the twisted blue lines with orange - red -- green and purple cross pieces. The frog in the picture is depicted with the amphibian's interim or tadpole stage (pollywog) and the cluster of eggs, Each fertilized egg has a complete set of DNA molecules in the cell's nucleus called chromosomes. These dark staining bodies, called chromosomes, are where the molecules of heredity. As large molecules capable of being inherited, or passed on, DNA are protected from external conditions such as ultraviolet radiation from the sun or acid rain, acidic water or pollution in the lake or streams. , chromosomes and cells may select for a diverse array of adapted forms. Turtles and frogs for example are very different, yet successful forms of life that have descended from a common ancestor hundreds of millions of years ago. Frogs have adjusted to life on earth for the succeeding millions of years. Today many frogs around the world are disappearing. From ultraviolet radiation to pollution there could be several reasons for the decline in amphibians worldwide. If the reason for worldwide decline in frogs is complex interactions, among atmosphere, water pollution, competition with fungus, and habitat fragmentation, then the lesson is that life today is on the threshold of a new combination of threats. Global ecological conditions, in many key natural areas, are undergoing rapid change. Some writers, such as Bill McKibben see these wholly novel threats due to ozone loss, acid rain and climate change as the most serious test of complexity, and complex adaptive systems, we have ever experienced. 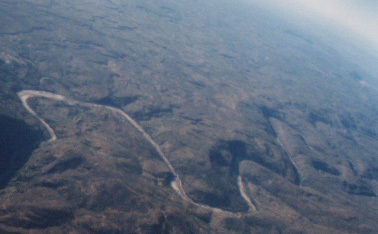 Another example of complexity is the conditions associated with river mouths. Estuary is the geographical term applied to the mouth of a river. Estuaries are coastal water bodies that display this adaptive response among plants and animals to the ecologically challenging conditions of fluctuating and reversing water flow, saline and brackish water chemistry, and competition from dry land, river and marine species! See Marshes of the Ocean Shore. Trees cling to the slopes below "Half Dome" in Yosemite National Park, 1994. The Earth is home to both nonliving and living complex systems. Complex adaptive systems distinguish the single celled prokaryotic beings from the eukaryotic beings because of certain enormous molecular structures or protein factories fabricating, according to genetic code, the structures of complex cellular existence. The complex cells of multi cellular organisms may have originated in adverse conditions when a symbiotic union of prokaryotic bacterial and algae cells combined to form a much larger cell with a well defined nucleus and specialized organelles to handle cellular metabolism. The process is known as coevolution. Dr. Lynn Margulis believes that the origins of complex cells with well developed nuclei, or eukaryotic cells, may have been the product of an adaptive response to stressful conditions existing on the early earth. We humans together with other animals and all of the plants, fungus and some bacteria are all comprised of cooperating unities formed by eukaryotic cells. Biology may not be destiny but what we are is contingent on what our ancestors were! 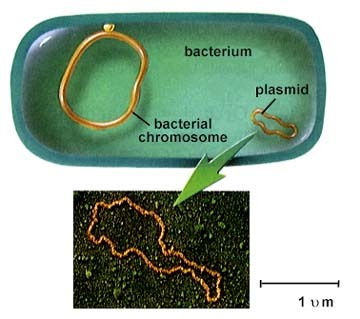 Bacteria are exceedingly small but efficient forms of life. What's there in a eukaryotic creature that is not in a prokaryotic creature? exotic organelles that feed, sustain and assist our cells to procreate. Paul and Ann Ehrlich on human biology and origins. All of these microscopic living machines function to maximize the survival conditions within our cells. Collectively the cells constitute the organism and collectively organisms constitute the species. As species collaborate in particular geographical locations and habitats they constitute a biological community. We are all, as Aldo Leopold said, citizens of the biotic community. These constituent elements of ecological systems are what is meant by the biological wealth of the planet. When we lose species that wealth is diminished. 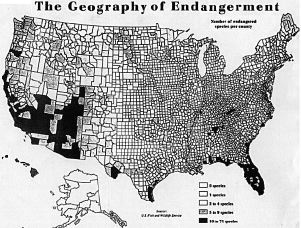 As just part of our natural heritage in America, our biological wealth is diminishing as our population growth, expansion of living areas and consumption of resources is robbing the landscape of repositories of that biological wealth that is the natural and cultural heritage of all humankind. The areas of the USA with the greatest loss in species are among the fastest growing places in the country: Arizona, Florida, California, Texas, and Hawaii. Unable to keep pace with the growth of human settlements the areas available for fisheries and wildlife have shrunk to unsustainable sizes for forests to nourish the streams that feed both wildlife and civilization. In each area of the country the fight over rights to extract resources by competing human sectors is converting wild lands thereby depriving wildlife of the very means of subsistence. There are three basic types of threats to animals and plants and thus the endangerment has three dimensions. First is the fragmentation of habitats that isolate species into smaller land units than are capable of sustaining the species. The second problem is the actual decline in the genetic diversity of a species, such as the Florida Panther making the remaining thirty animals incapable of withstanding opportunistic infections. poor health or other stresses. The third threat is the pollution of the biotic community or a disruption of the nutrient cycling within a biological community to the extent that the wildlife undergoes a dramatic decline such as the wading bird population of the Everglades or the drastic decline in the numbers of California Condors. The journal kept by John Muir was thus titled: "Earth, Planet, Universe." to convey a sense of place. Muir came to understand that all things were interconnected as he suggested "Everything is hitched to everything else." He recognized, as did Emerson, that we are tied by invisible material and spiritual threads to the fabric of creation, evolution and ecology. It was beyond a narrow economic vision to see how the livelihood of our human race was inherently bound to the livelihood of fisheries, birds and all living things. Muir warned his fellows that forests made for rivers to flow. Rivers nourished fisheries, wildlife and cities. Cities encouraged human values and ecological ethics. Ethics in turn, he saw would have to turn humans from takers of resources into caretakers of God's creation. 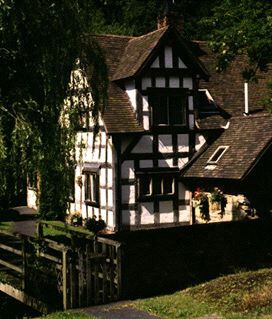 Muir discovered in the wild woods, soaring mountains and roaring streams the divinity of all creation to cherish forever and ever as a kingdom of power crafted to announce the glory of a just, merciful and loving deity. Thus it matters very little if people believe creation is designed by God, as Newton and Descartes insisted to reveal the complexity of his mind, or that the world by stochastic trial and error emerged with life flooding into its every recesses. Both perspectives do not diminish in any way the complexity of the cosmos and its perishable, or living and enduring, or non-living (abiotic) facets of existence. Either a divine expression of purposeful change or a delirium of ever fortunate gambles from generations ago, the world we live in is intricate, coevolved, and immense beyond comprehension. As such, complexity as a gift from previous generations, or an unintended coevolving living system is inherent in our world. Biological Diversity is an indicator of the extent to which complexity of life on earth thrives in some areas as opposed to other places. From the bacterial and alga worlds of waters and oceans to the air and the ice, life has colonized the darkest recesses, the hottest cauldrons and the highest abodes with microscopic organisms that make the whole planet function properly for life to continue existing. The sheer variety if these bacterial and algae concentrations defies our lopsided system of classification. But we now know that without the microscopic world the large mammals and predators that emotionally appeal to our imaginations such as sharks, wolves, whales and elephants could never have descended from common ancestors let alone flourish on earth today. 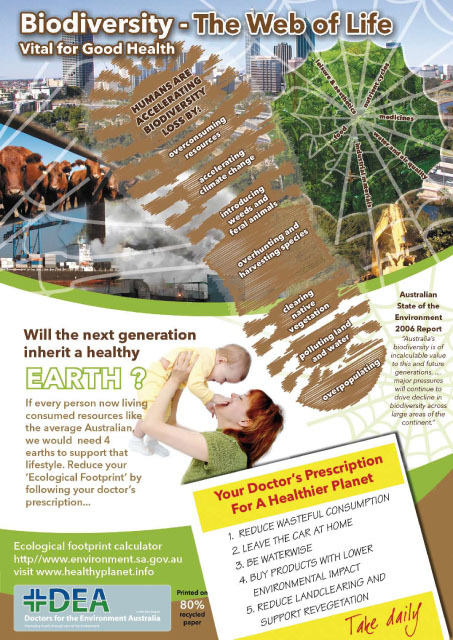 Beneath our very feet and noses are the tiny living beings that enable the earth to harbor life, allow the sun to sustain that life, and afford us the chance to breathe, eat and nourish all our needs. We are still learning that the air, water bodies, wetlands, forests, soils and shorelines are common property resources that belong to no one in particular. Instead they are the property of all people who depend on their ecological services and evolutionary roles to sustain, nourish and thus enable life to flourish on earth. Humans are but a small participant in this vast array of animal, vegetal, and mineral associations that bring nutrients to all creatures and remove waste from all living things. Without this circuit of living, dying and renewing parts of the whole, the earth and our world, as we cherish it would cease to exist. The great tragedy is that we think we can own these resources without paying too great an attention to the necessity of giving back to the earth what it has allowed us to take away from it in the form of resources. All resources ultimately belong to the common property of all living kind. Even an ingenious and most effective transformation of natural features or materials into commercial resources and useful products requires the craftsman to return some portion of the material once taken away from the sources on this planet, back to the earth to renew this bargain of life. Unless we give in proportion to what we receive we break the covenant of reciprocal favors forming a stewards' faith that binds all creatures together on this living earth. "The house in which I live is built upon solid rock, but sandstone crumbles perceptibly, and the coast upon which I live is eroding. It is also sinking. I am going down in the world." "One day the ruins of this house will ooze into the sea. The ground beneath my feet sinks and heaves and distorts with episodes of drought and flood and frost. 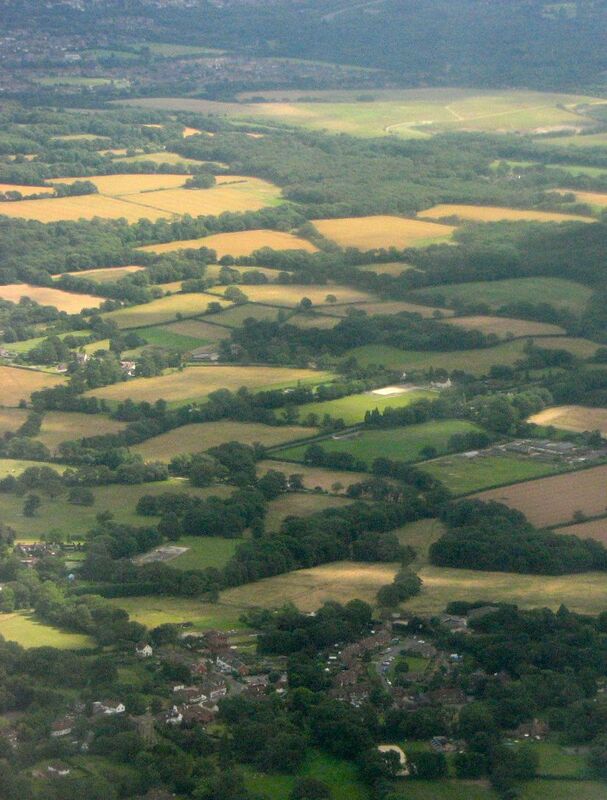 "The county in which I have made my home (Sussex, England) . . . . only a few years ago, this country was part of a continent, and a few tens of thousands of years ago it was near the frontier of vast, approaching glaciers, and a few hundreds of thousands of years before that, lions and rhinoceros roamed its grassy plains." Tim Radford, The Address Book, p. 3. 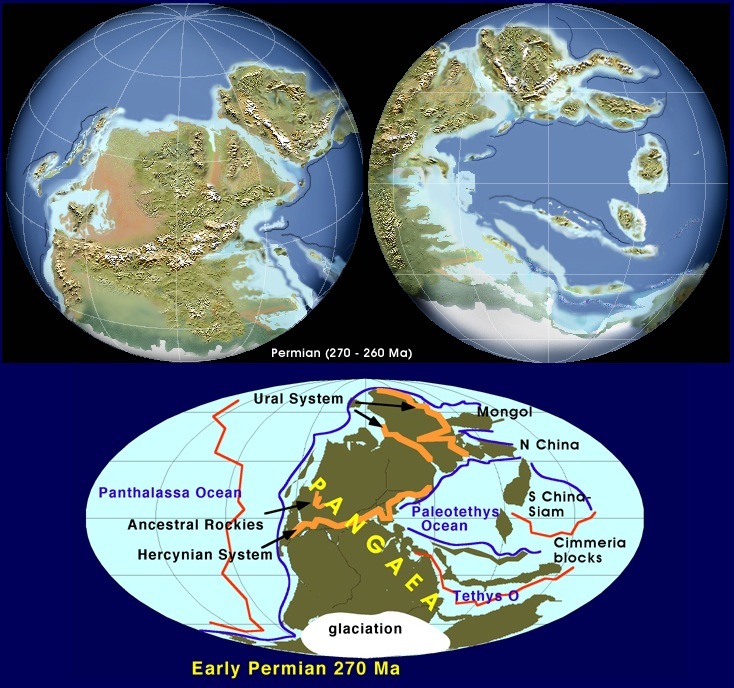 Artist's rendering of the Earth 270 million years ago. Ideas on this web site are used to convey concepts about the complex character of the Earth's geological and biological wealth, the importance of those living storehouses of evolving wealth and the various ways such biological diversity adds to the human quality of life on earth. Coevolution refers to the complementary changes in animals over time that are related to one another in terms of their ecological means of making a living and their descent from a common ancestor. The term may also refer to the coexistence of animals and plants or plants and fungus or bacteria and plants in the same organism so that the survival of one is dependent on the continued existence of the other. There are entire plant and animal communities on earth that are made up of coevolving organisms. symbiotic organisms; made up of plants and fungus that together live more ably and are better adaptive than they would independently. These lichens flourish in the extreme cold, damp or warm situations. 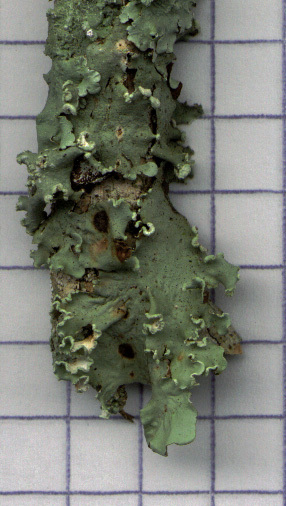 In temperate areas we find lichens on some trees, but in the arctic or frigid zones of mountains they thrive almost to the exclusion of other plants and fungus. 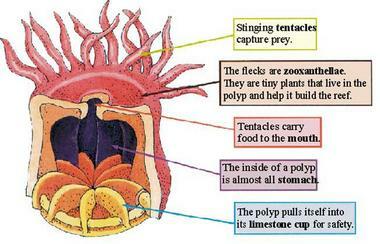 Another example of two organisms living as one together are seen in the animal polyps that build coral reefs. These animals are called polyps because of their shape but live together with single-celled algae found within the tissue of the polyps' tentacles. 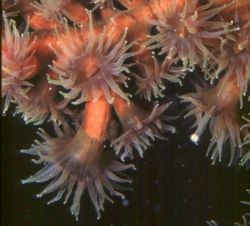 Together the polyps and the zooxanthellae algae thrive more successfully than either would independently on their own. "The world is beyond our comprehension… . more importantly, the ultimate results we receive from these tools still have to register in the human mind in order for results to be meaningful. These tools [Tools such as microscopes and telescopes . . . , have been of . . . value in helping us create a more useful understanding of the world in general . . . . ] may extend our physical senses, but there is no escaping the fact that the results are still going to be limited by the nature of the human thought process. So we cannot create a tool that will present us with the True nature of reality because the output from any tool will still be subject to the limits of our mind." John D. Erickson, Truth and Reality, (2004) Chapter 3, n.p.c. Change due to the ice age. In a different context, over a longer frame of time, it can and has been said, by way of analogy: geology, life, and climate on earth have coevolved. Each aspect of the living world have collaborated and shaped nature as we see it now. The atmosphere is a product of life, the earth's biological diversity is an insurance policy against the loss of ecological integrity. Based on water - energy - air - air - land the inorganic complex provides the optimal crucible for life. We dwell on a craft managed by and for living things. 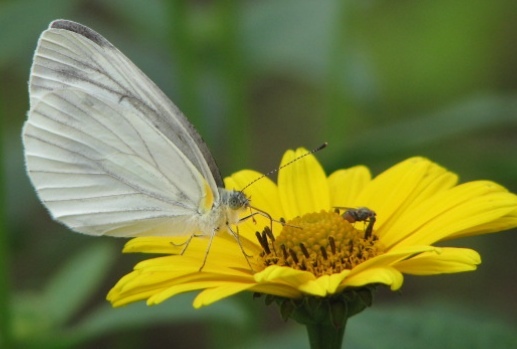 Insects are believed to have assisted in the spread of seed bearing and eventually flowering plants because they spread the pollen from one plant to another as they feed on the nectar among a variety of plants. 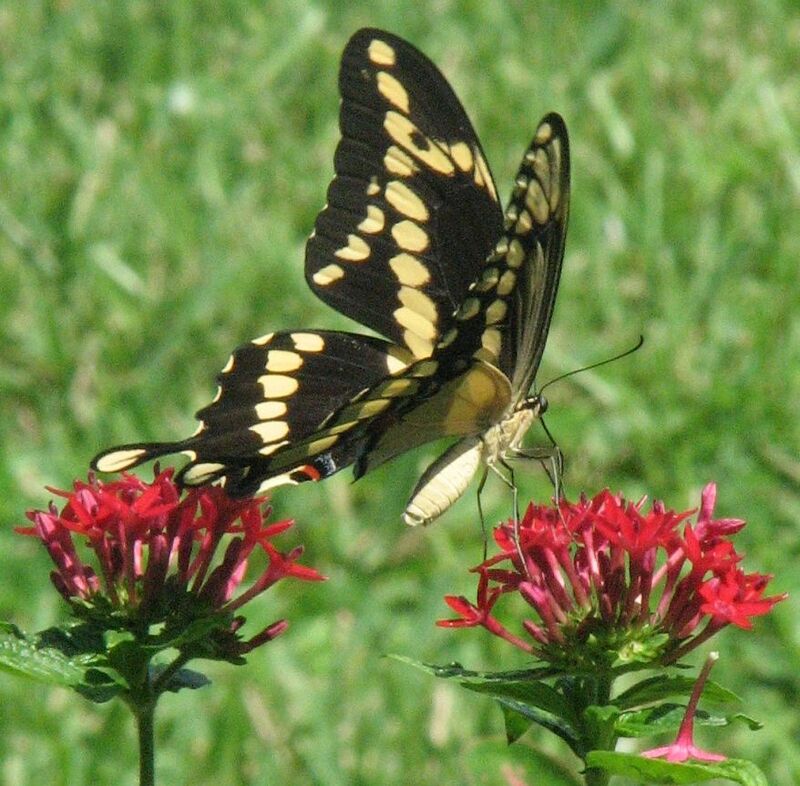 That means by feeding on the fruit or the sweet fluid nectar of the flowers, they encourage the fertilization of plants. Interestingly enough, bats and insects are the principle means of many plants becoming impregnated with the hereditary material of other plants of the same species. 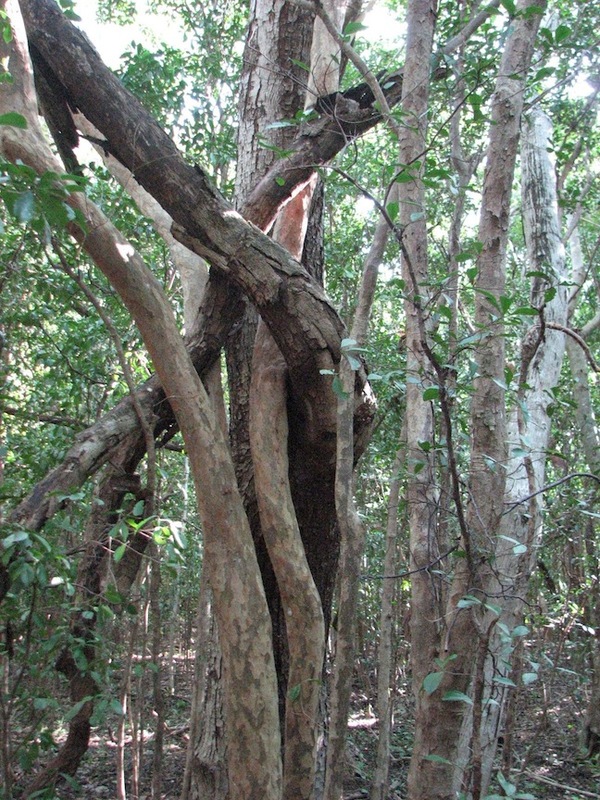 The tropical hardwood forest is a refuge. The forest is an adaptive system of related and unrelated species that function in some complex manner that reveals the functional relation of each part contributes to a whole that is greater than the mere sum of the separate contributing elements. Suddenly when a number of species over time inhabit an area, the conditions are more stable than if a single species and its prey were the sole members of the place. Thus the world of the quark and the Jaguar in a jungle are not simple, but the products of complex adaptive systems whose inherent responsiveness to conditions generates opportunities for ever more wondrously adapted living creatures from whom we have all descended to play this game of life. 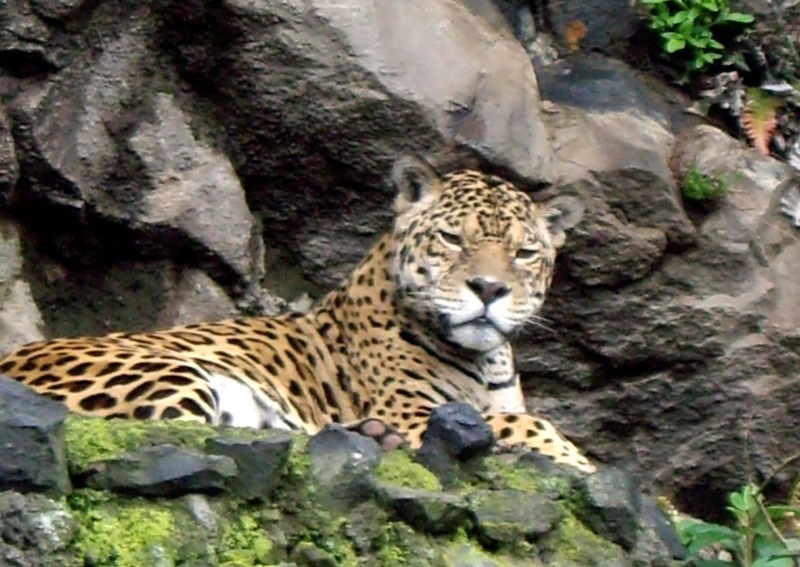 Jaguar in the Andean jungles.